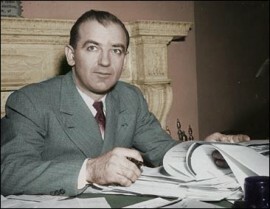 Joseph McCarthy: His efforts to expose and remove Communists from the U.S. government caused forces far wider than Communism itself to viciously attack and destroy him. There are profound lessons for us today in the saga of this misled hero. “Average Americans can do very little insofar as digging Communist espionage agents out of our government is concerned. They must depend upon those of us whom they send down here to man the watch-towers of the nation. The thing that I think we must remember is that this is a war, which a brutalitarian force has won to a greater extent than any brutalitarian force has won a war in the history of the world before. “You can talk about Communism as though it’s something ten thousand miles away. Let me say it’s right here with us now. Unless we make sure that there is no infiltration of our government, then just as certain as you sit there, in the period of our lives you will see a Red world. THOSE WORDS were spoken 40 years ago by U.S. 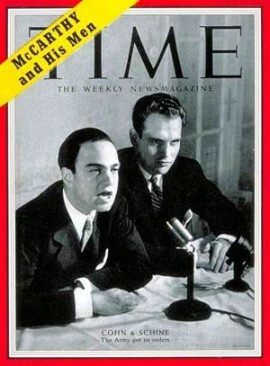 Senator Joseph Raymond McCarthy, Republican of Wisconsin, a man who since has been demonized unjustly. Since McCarthy’s time the subversion of our nation has proceeded steadily, and his warning to us resonates more and more clearly as truth, now that death for this civilization is in view. Roy Cohn and David Schine: agents of destruction given huge publicity by the media as "McCarthy's Men"